So I read a post a while back from a photographer from the Rising Tide Society which contained her photo bucket list. I thought it was such a great idea that I wanted to make my own list. 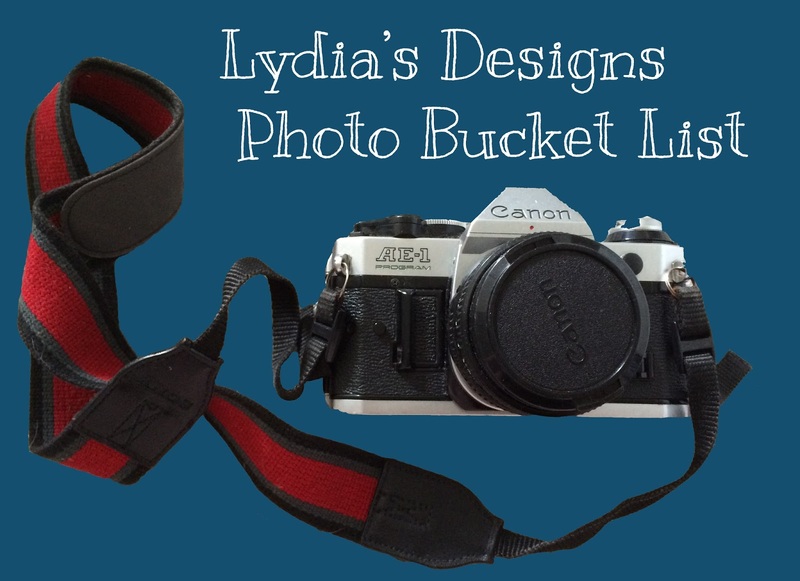 It's a really great exercise in being mindful about my goals, and since two of my goals are using my DSLR more and getting my home darkroom set up this goes right along with them. Set up my home darkroom. Right now I have an unfinished bathroom that's just the right size for a personal darkroom. 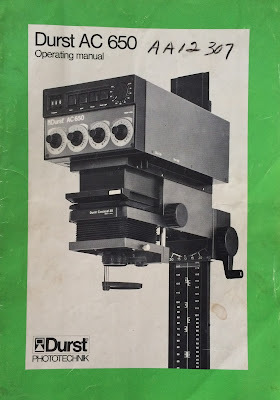 I also have an old enlarger, some small trays and tongs, a beaker, and some other small things. So what I really need to complete this is a sink/cabinetry for the wet side, a redlight bulb, chemicals and jugs to store them, a heavy duty trash bin, a table for my enlarger, some shelve for storage, a couple of large trays, and a proper seal for the door. 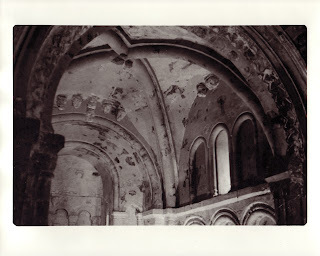 Go back to Ireland and photograph more of its beauty. Photograph a castle, even better if there are costumes involved. Go out west and photograph the milky way. Photograph all the national parks I visit in my quest to visit all the ones in the US. Photograph a North-South tour of Chile. 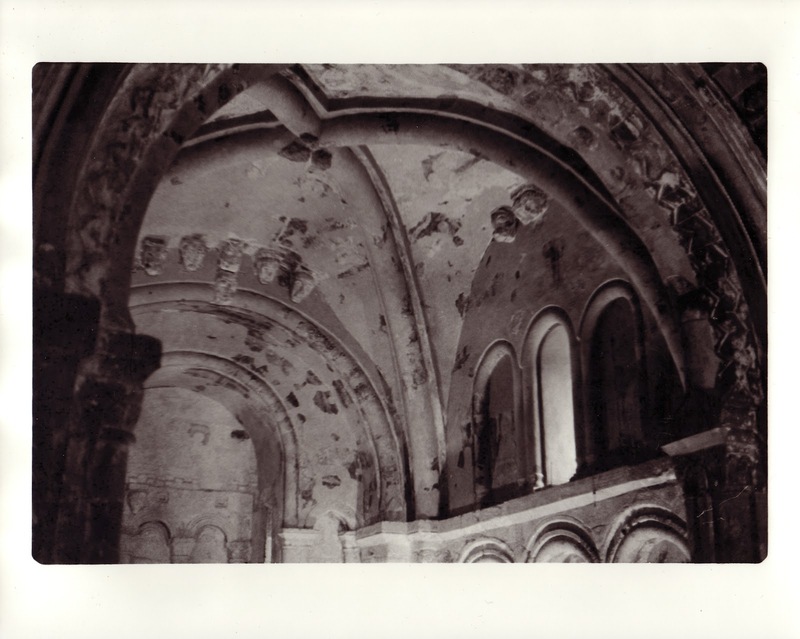 Visit some of the towns in Germany that my ancestors are from and photograph them. That's my list, and I'd love to hear about yours! Comment below, or write your own blog response and tag me. On to the Book Reviews! From here on out every Wednesday you'll get a comic review and a novel review. Today's novel is Off To Be The Wizard by Scott Meyer. In Off To Be The Wizard our protagonist Martin discovers a computer algorithm that controls all life as we know it. 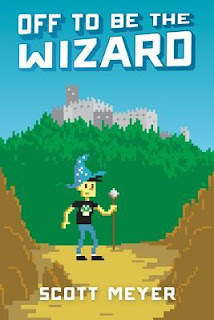 He does what more any guy would and messes with it, first to get cool stuff, and then once authorities are on to him to jump back in time to the middle ages where he has plans of becoming a wizard and living well. Only it's not quite as easy as he thinks to pull off. I found this book to be a really fun read, and have already started on its sequel. The only problem I has with it was the severe lack of female characters, this book would in no way pass the Bechdel-Wallace test. It left me feeling that the author just didn't know how to write women. However this next book may change that, we'll see. In any case this book is sci fi, nerdy, light-hearted fun, that's also very accessible to readers of all kinds. 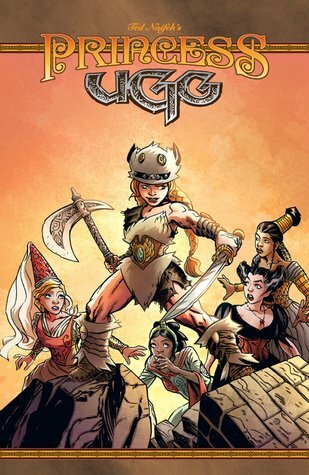 Next up is Princess Ugg Volume 1 by Ted Naifeh and Warren Wucinich. Princess Ulga is urged by her mother to find a better way for her people to live, so she goes down into the valley, leaving her highlands for a princess academy. What follows are misunderstandings, a community that looks down on her and many obstacles for her to overcome. Ulga has the determined heart of a warrior however, and is set on learning from all the encounters she has in the valley. It's a cute, mostly light-hearted, and rather witty read, that is welcoming to both younger readers and adults. It has just enough twists and excitement to keep what could have been a very formulaic read more interesting. Thanks for reading, I'll see you all again Friday! I've spent some of my weekend working on my studio. It's finally starting to feel like my own space as I put things in their place and nail up various shelves and planning tools. At the new house Bryan and I will have a shared workspace in our second story "rec room". 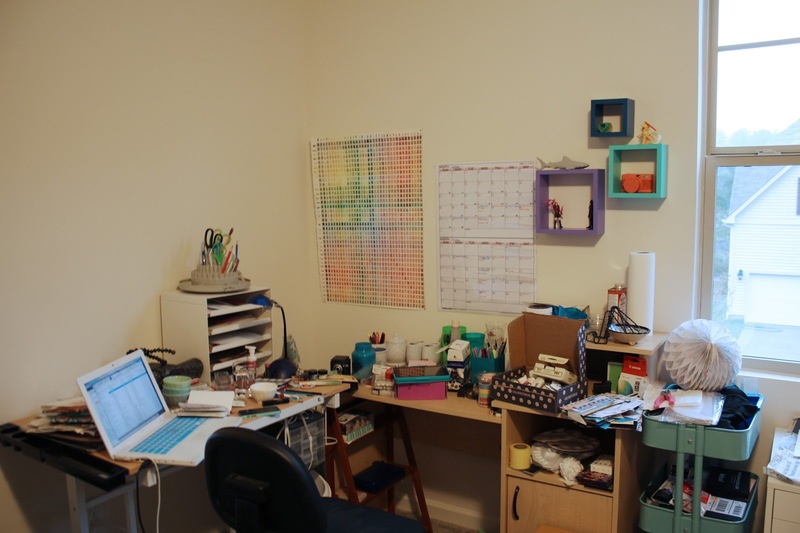 The space is a great size for an extra large office that will accommodate our three desks, all my art storage needs and incorporate a little lounge area. Our end goal is using the upstairs space more for our down time needs, so we can keep our downstairs spaces cleaner since they're more public. For now there are still a enough boxes left to be unpacked that it's hard to get a good picture of the room. So now I'm feeling good about how our space is coming along. Here are a couple shots of my corner. I still have more to put on the walls and supplies to sort out, but it's coming along nicely. This picture is from Friday and over the weekend I completed a couple of small projects, which are going to enhance my work corner even more. First off I got a pack of these tissue paper honeycomb balls◊ and decided to DIY a splatter paint job on one with watercolor. I think the first try looks ok, and I'm going to do another with acrylic paints to see if it works better or just ends up sticking the paper together too much. Here are really easy instructions for how to do it. First off you'll want newspaper to protect all surfaces near your project. You probably need two sheets, I only used one in the image above because I'm lazy. It makes for messes later though, and that's never worth it! Here's what they look like with water. For this project most any brush will do, though it might get ruined if you're too vigorous. For real brushes I loaded the brush with paint and flicked my wrist to move the paint. The picture above gives you an idea of how much water was used VS paint. It really only takes a little! However I only mixed enough of each color to create the one honeycomb ball, so I wouldn't be wasteful. Also for opening some of the tougher paint tubes I use a silicone jar opener! It works wonders, and I've been given several over the years as freebies. And here my first version is done. 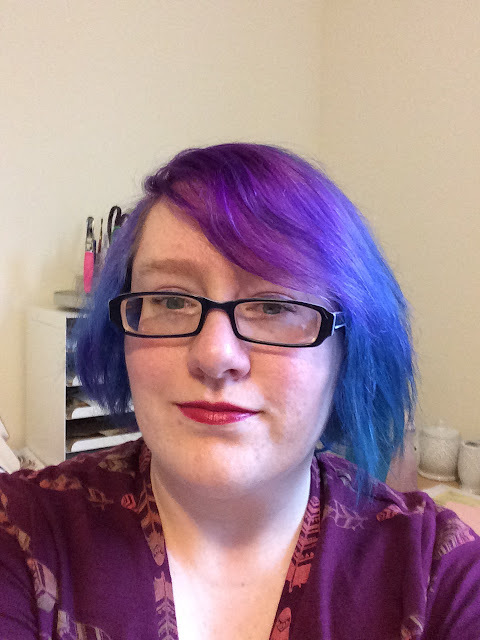 It's more pastel, which I love, but you can use less water to get brighter results too. I found that because the paper is easily saturated you can only use two colors at a time before letting everything you've done dry (about an hour and a half) before going on the the next colors. This honeycomb has a string you can hang it from so you could paint it while it's hanging to be more neat, especially if you have a porch where you can set things up. Sunshine would definitely speed up the drying process, my work was done on a rainy day, so it took longer to dry. Then you just have to decide how you want to display them! A while back we got a set of shelf cubes for our bedroom, but we don't need them at the new house because I now have enough space for a bedside table rather than having the bed too close to a wall as I did at our old rental. So I decided I could put the cubes up in my studio as extra storage for little inspirational items. 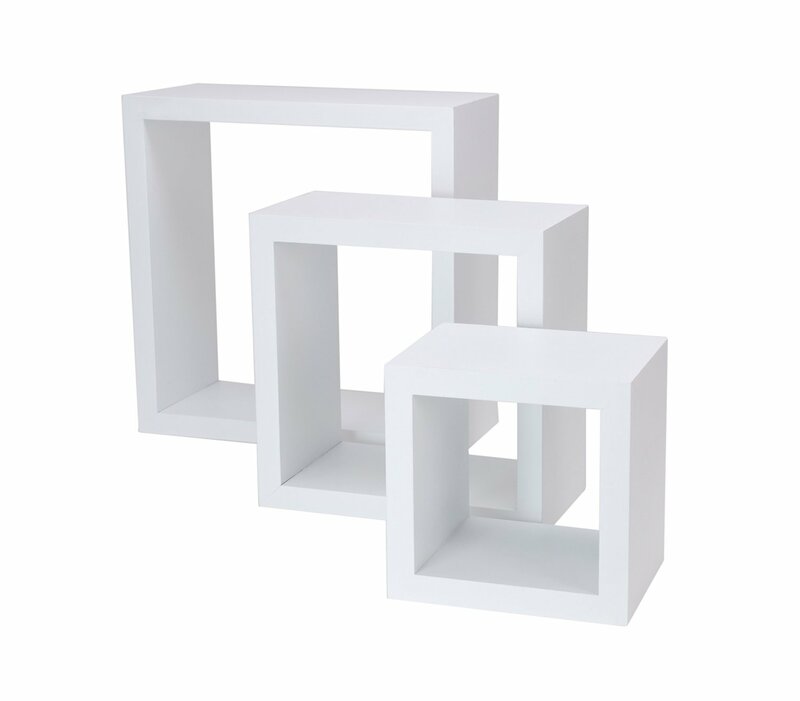 The cubes came in a set of three different sizes and though it looks like they might not carry the plain ones at Target anymore here are some similar ones from Amazon◊. The ones I had were more matte in finish so I didn't even need to sand them, I just used two coats of custom mixed paint colors. If you have shelves with a shinier finish rough them up a bit all over with a fine grit sandpaper before painting them so the paint will stick and not peel off. I used Winsor and Newton Acrylics because I had a lot left over from college (Freshman year kits were required gear! ), but you could use most any brand you want. 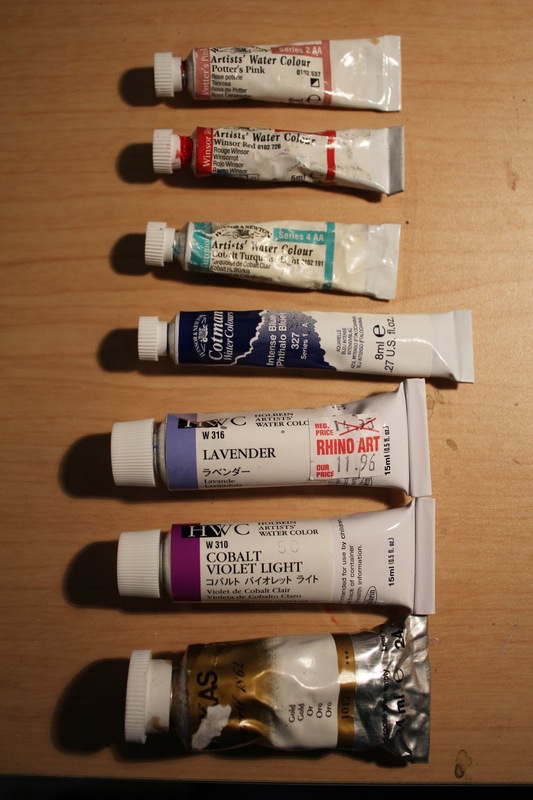 If you wanted to buy online you might want to give Utrecht Acrylics a try, they're a good deal for good quality paints. Some brands and colors may need more coats than others. I added a good bit of white paint to all three of my chosen shades, which helps make them more opaque. Here are my finished shelves! I set them down to dry on newspaper after each coat, and held them on my hand to paint them. If you want to paint them easier without having to hold them I recommend using a cork trivet or putting them on top of a cardboard box. If you have drips it will stick to newspaper and might mean you have to touch up a little later, cardboard is less likely to run into this problem, and cork is free of it unless you have a bad enough drip that it just peels the paint off. Mint, lavender, and dark blue are some of my favorite colors. And finally here's a shot of my studio with the shelves and my watercolor reference chart set up. It's still pretty crazy, but getting better every day. I almost know where all my supplies are! That's all for today. Let me know what are some of your favorite colors to decorate with in the comments! Thanks. So today I wanted to talk about some of the fashionable folks I'm inspired by and soon I'll also examine some of the recent frustration I've had with my fall capsule wardrobe, but that's enough for a whole post of it's own. I know she's got the whole manic pixie dream girl thing going on in most of the acting she does, but her style is just great! She rocks the retro inspired looks hard and stays adorable while she makes music, helps run the website she cofounded, and acts. The link above goes to her site Hello Giggles! Ms Monae writes brilliant music that crosses genres forming a commentary on society as well as singing about love, and even science fiction. Bryan and I both really enjoy her music and her style draws from retro and menswear styles, though these days she's doing more feminine looks too. Felicia is kind of nerd famous, and I love her. She's written a book and been in numerous TV shows and such. Along the way she's great at finding ways of staying true to herself. Her style is the most casual and in many ways the most like my own. Who inspires your sense of fashion? I'd love to hear more and be inspired by you too! First boil the pasta until it's al dente, or if you're like me as soon as you look in the pot and see they've grown, then drain the noodles. Then add all the items in your crock pot except the parmesan, bread crumbs, and bacon, stir them a bit and set the crock pot on low. Come back and stir every half hour and in 2-3 hours it will be done. You can tell it's done when everything is melted, smells good, and cheese starts browning on the sides of the pot. When it's at that point just add a layer of the parmesan and bread crumbs on top, put the lid back on and set your crock pot to warm until you're ready to serve. If you want to add bacon to the dish cook the bacon separately in the oven. My favorite method is by putting the bacon on a foil lined pan, into the oven and then setting the temperature to 375F for 20 minutes. After 20 minutes if it's not done just check it every few minutes until it's done the way you like it best. You can then chop the bacon and add it to your bowl of macaroni. 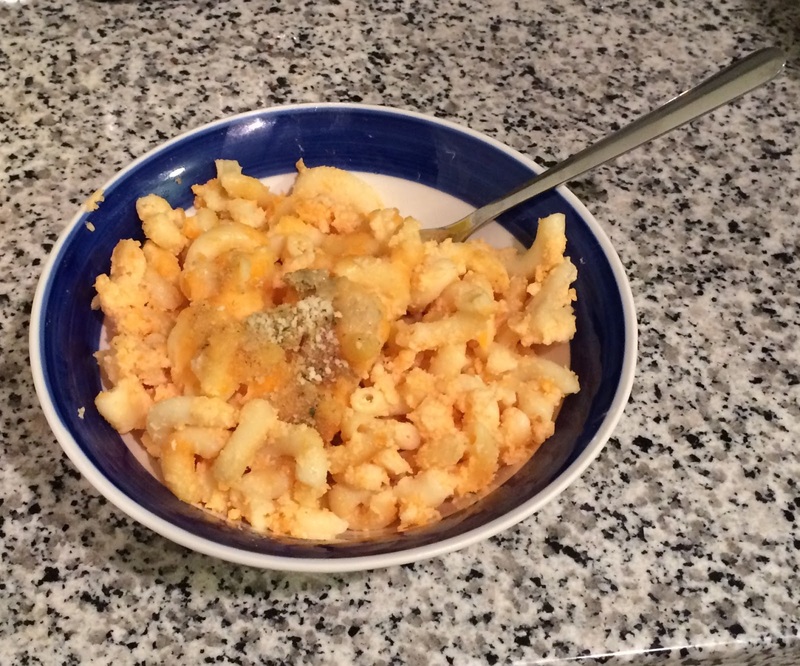 We found that as a main dish this recipe feeds 5 adults, as a side dish it would feed 10. It is very cheesy and fill you up more than you'd assume because of this. A Walk in the Woods by Bill Bryson was a really interesting read. I had picked it up at a thrift store a while back knowing Bryan had enjoyed some of the author's books and thinking a book about the trail so close to where I group up in Roanoke would be interesting. And it was! The Appalachian Trail stretches from Georgia to Maine, with an extension trail that goes on up into Canada for those who wish to keep going, and Bill and his friend are about to tackle walking it all. 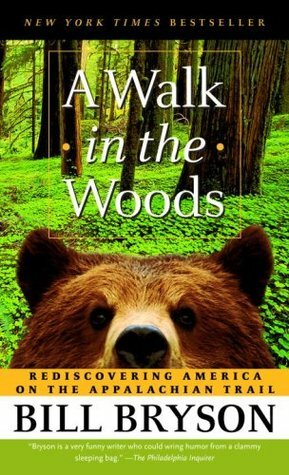 I think I ended up enjoying some of the more thoughtful sections of the book on history, nature, and the influence of man on it all better than I did some of the parts about the experience of walking the trail and the humor involved (the humor actually put me off a little at times). I could mentally picture what it might have been like to see the huge old chestnut forests. All in all it makes me want to go out and walk some parts of the trail and photograph it. This is the kind of book that many readers will enjoy, but there will be parts you can take or leave along the way. However, it's all worth the trip. 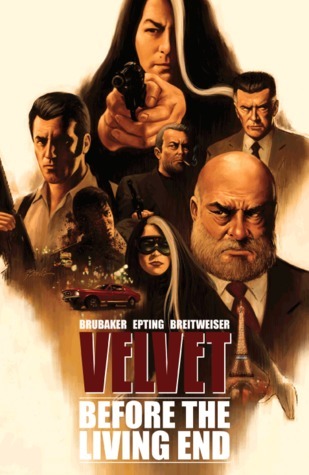 Velvet Volume 1 by Ed Brubaker, Steve Epting, and Bettie Breitweiser is the quintessential spy story. A spy is framed and has to revisit past memories to find out the secrets that will allow them to clear their name. Only in this case it's a middle aged female spy who was just working as a secretary at the time she was framed. Over the course of this first book we find out just how much she knows and doesn't know about those she has spent her life working with. And all this while she's on the run from her own agency. This was one of our reads for the Word Balloons discussion group at Fight or Flight Comics (my local comic book store in Raleigh, NC), which I probably would never have picked up otherwise. It reads like most spy movies and has a fairly formulaic feel, but undeniably left me wanting more the moment I finished reading it. That's all for today, but I'll see you again Friday! So today I'm going to do a bit of a beauty post. I love the concept of getting curated boxes in the mail, and I've tried a bunch of different ones over the last two years. I've done art supplies, snack, and some of my favorites are beauty boxes. I really enjoy these kinds of boxes because for beauty items Bryan gets bored if he goes shopping with me, and I don't really want to drag him out to specialty stores like Ulta, Sephora, and the like to make it even worse. Additionally I'm not always sure what to try, so trying a bunch of smaller samples can be great for someone like me since I don't usually wear a lot of makeup in the first place. It's not because I don't enjoy wearing makeup, but mostly because I'm really pale so foundation and concealer are near impossible to find. I once tried to get makeup from MAC, but everything they made was just a shade or two too dark and probably oxidized on my skin before I left the mall. Not that I even knew it could oxidize, I thought it was just different in the sunlight than under artificial lights, and maybe I was right. It's been to long to know for sure. Plus my skin is rather sensitive, so that's another thing to work around. But with beauty boxes most of the items are less skin focused other than general skin care. Without further ado let's get on with the unboxing! 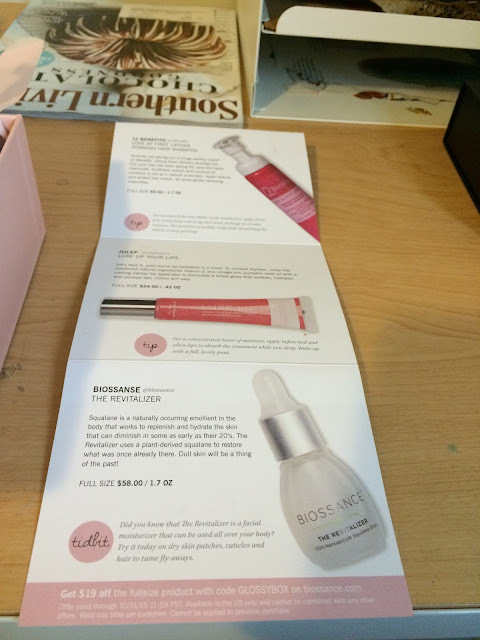 The first box I want to share with you all is this month's Glossybox. The advantages of Glossybox are getting 5 (usually full size, if not travel size) items each month for $21. I find they're usually very good about picking things I would enjoy, and the more I fill out surveys the better my boxes are! Their products are also premium quality, mostly items that are found in specialty beauty stores, with some exceptions. This lovely box comes packed inside a more sturdy shipping box. Inside there's a product explanation and use sheet, and sometimes a coupon or other fun item of some sort. It has a ton of great info, I love how detailed it is and often refer back to it if I'm unsure of anything. I was excited to get this because I really love lip products, and Julep makes very good ones, which you'll see more of later. 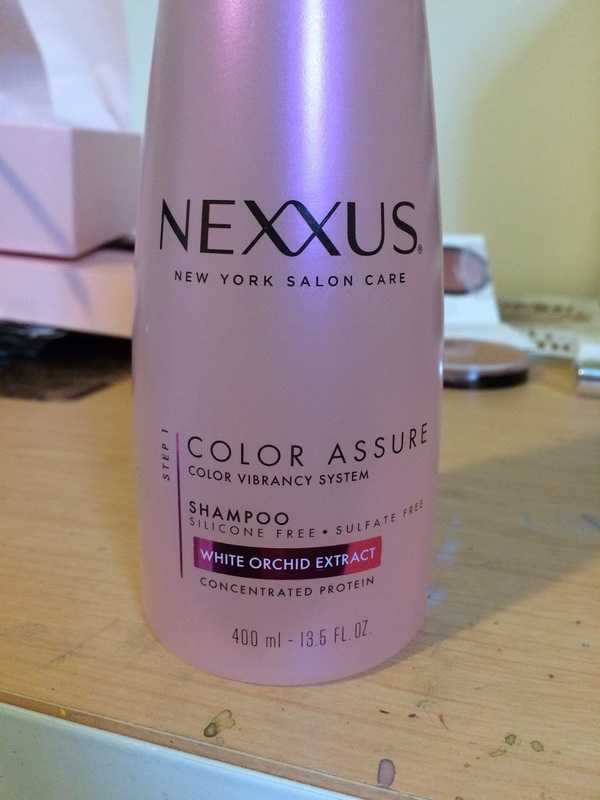 And this is the item I chose to replace the Emite blush, Nexxus Color Assure Shampoo. 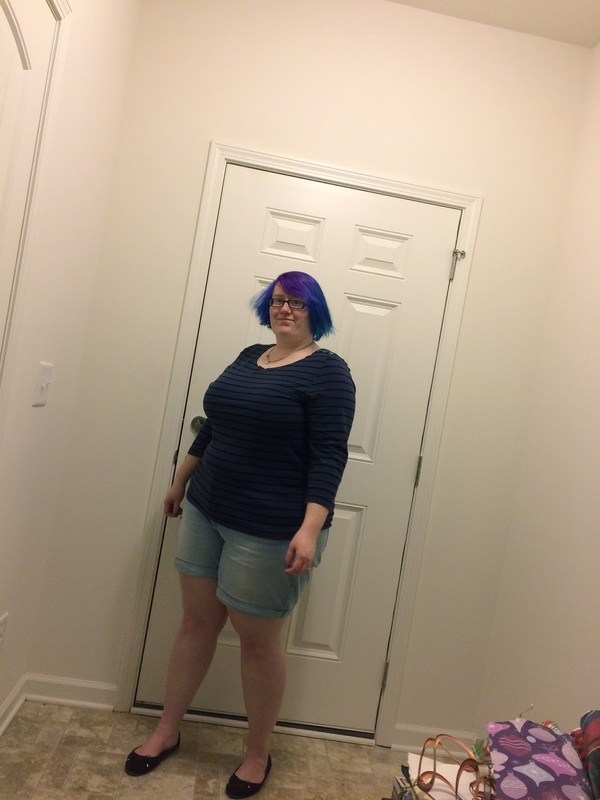 This is actually a size larger than what I'll be getting, but I received one a few months back and realized how well it worked on my brightly dyed hair and made the switch. 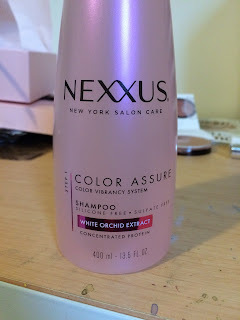 I was using Herbal Essences Color Me Happy, which smells great, but doesn't work half as well as this! 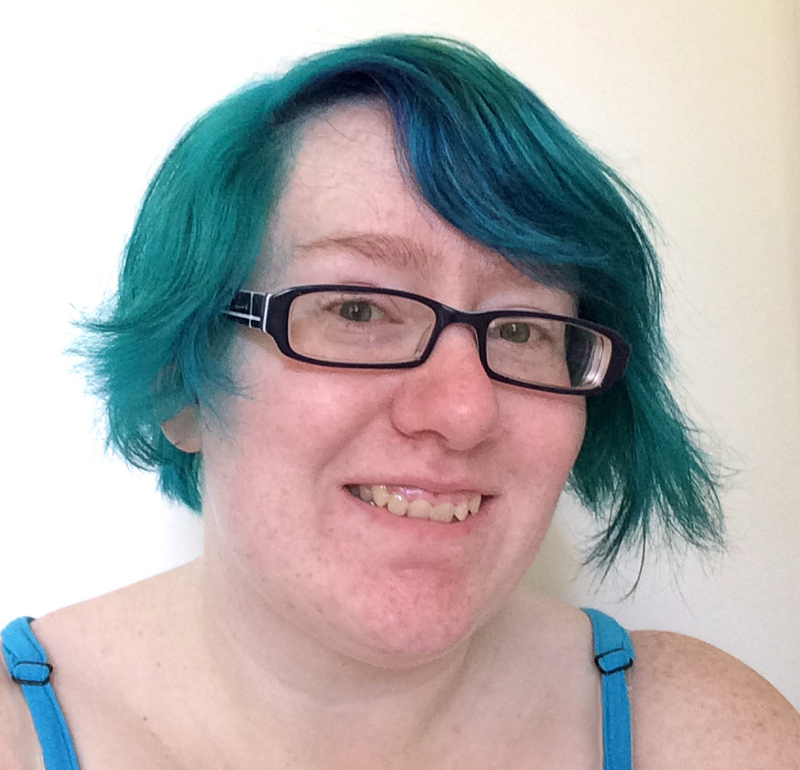 If you use more temporary colored dyes in bright shades like me I highly recommend it! This full size bottle can be found for about $14 at Kroger or other grocery stores (they recently had an online coupon for $3 off) or on Amazon too◊. If you like the sounds of Glossbox I feel it's definitely worth a try. 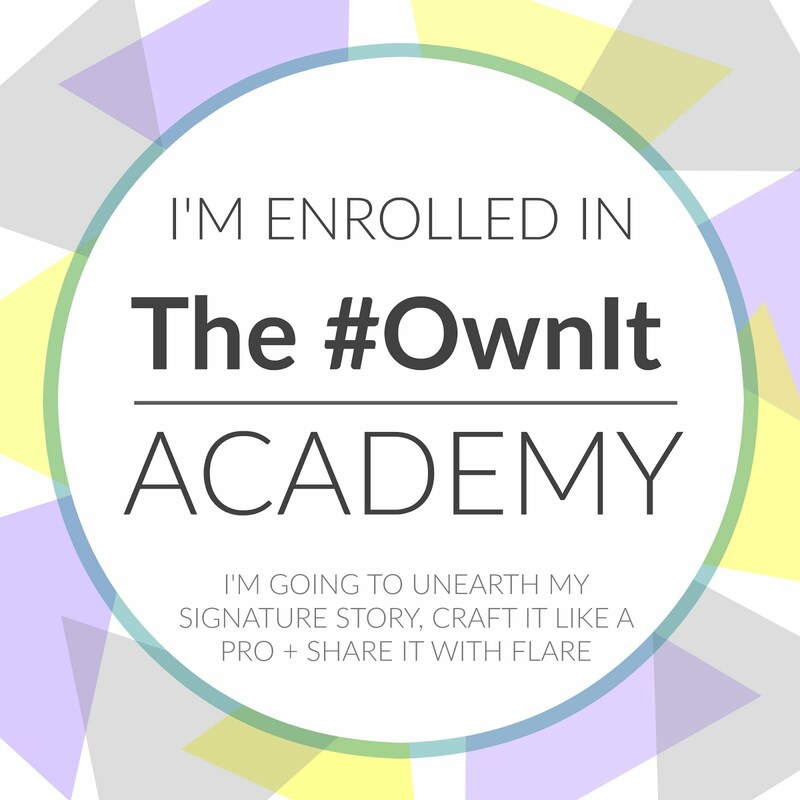 If you do join I'd love it if you could use this link to tell them I sent you! This is how it comes in the mail, a bit simpler than some boxes, but packed quite safely. 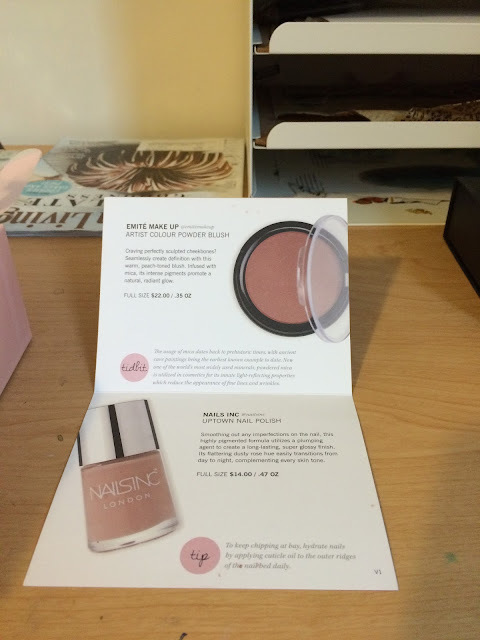 It's my favorite beauty box for several reasons. 1 you can skip a month anytime you want, for as many month as you want. It's perfect for someone on a budget. 2. There are two box options, one gets you the monthly curated selections for your chosen profile for $20, which sometimes allows you to select a color for certain items like lip or eye color. Or you can pay $5 more and get to choose from about 100 different options for your box contents, usually ending up with 3 items, plus any add ons you might choose at a discounted price. 3. They specialize in nail polish! I may not be super when it comes to makeup, but with my nails I really try to be on point and keep them beautiful. So this is the perfect box for me! But if you only want a little nail polish that's ok too, they usually have boxes with both things and at least one with just makeup too! When you open up the box it's got recyclable paper packing material inside, your items, plus a monthly card highlighting the items and sometimes a technique related to some of them, and sometimes an additional goodie or coupon. In this box I got a Plush Pout lip crayon in Magenta Plum Creme, and 3 nail polishes, one of which was an add on item. It looks pretty dark, and I was a little scared it wouldn't suit me when I pulled it out, but as you can see below it's a great color for me! This month's card has a couple lip techniques plus how to get the dewy look. 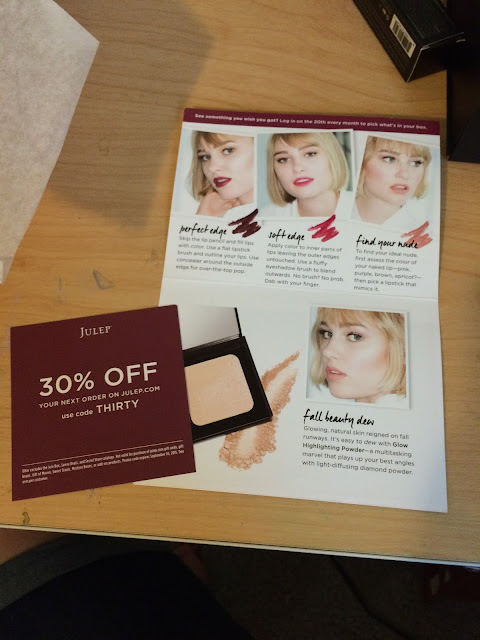 And yes, feel free to use that code if you're already a Julep member, but if you're not keep scrolling down because there's a better deal for new members below. 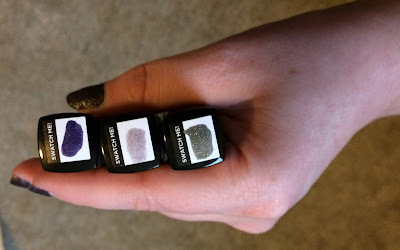 Here are the three nail polishes. Julep names their polish colors after women, so these colors are Ellis, Delores, and Lydia! They're really beautiful shades with Eliis being a soft pinkish lavender with silver undertones from the holographic qualities. It doesn't come off like glitter polish does, but is much easier to remove, which I love! Delores is also a holographic with a purple and silver finish. And finally Lydia (yay after 2 years they finally made my name a color!) is a pyrite metallic that shifts between old gold, olive, and brass tones and has a stardust finish. 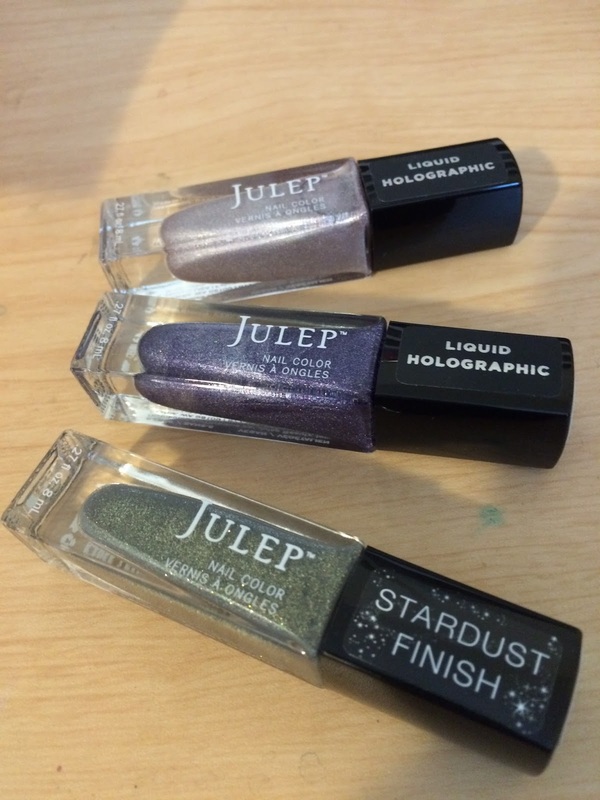 Julep's stardust finishes are highly textured, with a little less shine, but a bit more glitter mixed in. They dry really well and there's an example below too. Here we have Delores on my toenails. And on my hands I've got Glam Roc a purple black stardust finish, to give you some idea of the level of shine it gets. And here you can see swatches of each color, Delores, Ellis, and Lydia. 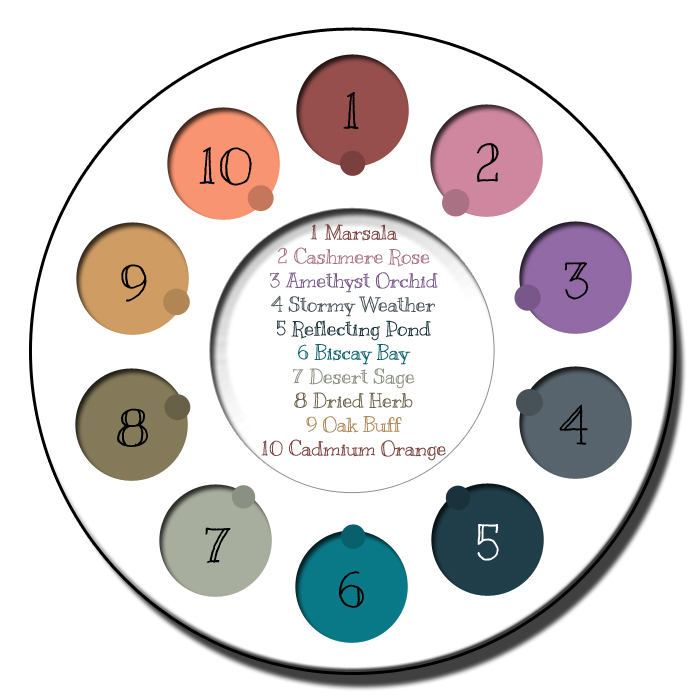 Their polishes are free of the 5 big toxic components that have been traditionally used in nail polishes. And the quality of their polish is amazing. Without a top or bast coat they last about 3-4 days without chipping, and with the base and top coasts I usually go a week without chipping. If you use this affiliate link you can get a great deal on your first box◊! And after that you can skip as many months as you want, though if you do buy anything they do pass a $15 credit on to me, and you can get the same for referring your friend, who can also get free boxes. There is really nothing to lose in trying this box out, which makes me love it more. And no, I don't get paid to say anything about the content of this post, just normal customer rewards programs, which you all can take or leave as you wish. And for those of you who aren't as interested in this type of post, don't worry, I plan to only do one per month of this sort, and I'll be rotating through some other boxes, so perhaps another one may suit your interests better! Next month I'll show you the goodies I get in my trial of Japan Crate, a box with over a pound of Japanese snacks. I'll see you all Wednesday for a new book review and more. 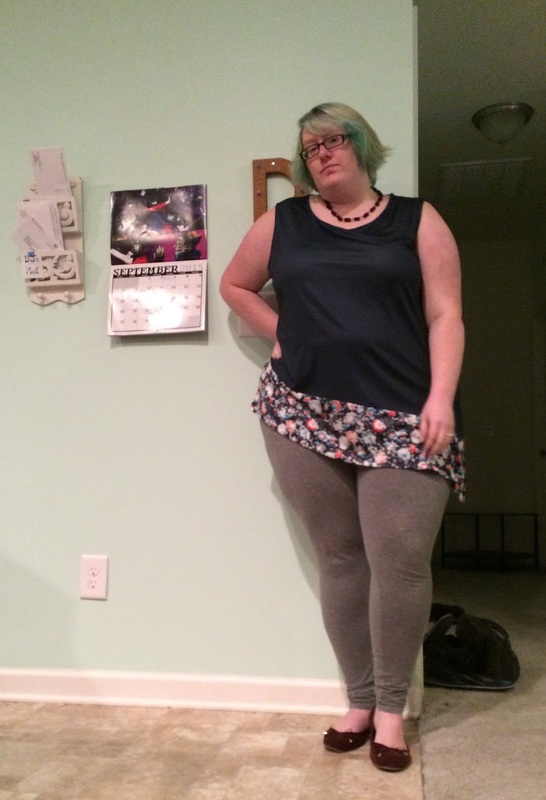 Today I have a couple of outfits to share, plus I wanted to talk a bit about color. Pantone, a design company whose work revolves around color releases apparel color trend reports for each season. And I wanted to show you all the one they created for fall. They call it Fall 2015's "An Evolving Color Landscape" They basically try to predict what colors will be popular in a given season, and honestly at this point they are some of the people who are setting the color trends because they're so widely viewed. Over the last few seasons Pantone has noted a trend for men's and women's clothing to use the same color palette, meaning that sometimes colors don't have to feel feminine or masculine because they're using more muted colors overall. I think it's interesting to look at what they choose and compare it to the colors I wear and also look at it in light of various skintones. For example, I'm a cool skin tone, my skin has a lot of pinks and blue shades in it so I tend to wear cool or neutral colored clothing. Those with warmer skin tones have yellow, tan and rich brown shades, some folks are more in the middle with no obvious yellow or blue tones, but they might have olive or green undertones and they can wear many colors well with their base being in neutrals most often. You can check by looking at the veins on your wrist what you skin tone might be, and you can find out more about this on Pinterest too by searching cool, warm or neutral tone clothing colors. Reflecting Pond makes Desert sage look nice and cool as it we were preparing for a storm, now let's make it look warm. 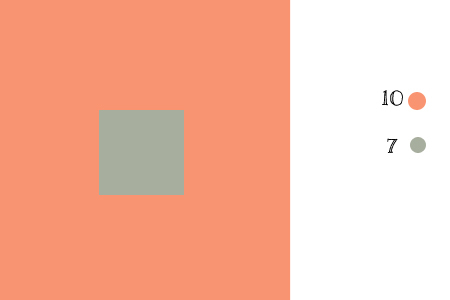 Well look at that, now that Desert Sage resembles nice warm sand when it's put beside Cadmium Orange. Color is magical you guys! Want to have your mind blown again? 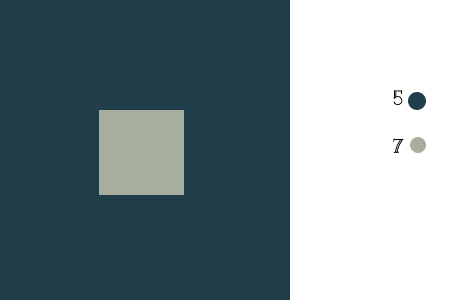 Scroll back up to the color palette. The text describing each word looks like it's the same color shown in the big circles right? Nope, it's actually the color shown in the smaller circle, a darkened version of the real color that I made because the white background changes how we perceive small amounts of color on a mainly white background. 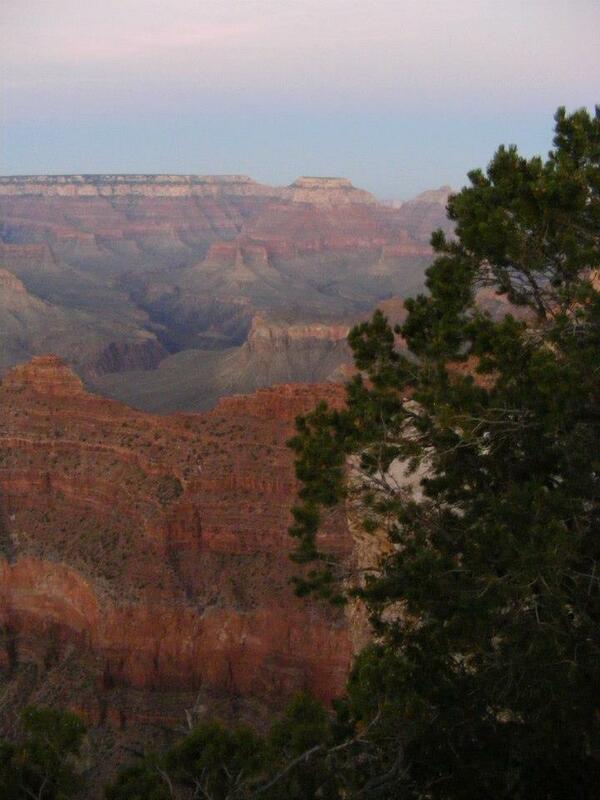 The text color works the same way as the small squares of the Desert Sage do. Because you're only seeing a small amount of color it's influenced by the main color taking up so much more space. So if you want to make a neutral look warmer or cooler just pair it off with A brighter color, B a greater amount of that bright color, and C if you can place the neutral in the middle of the brighter color rather than at the edge of it. All of these will help change your neutrals into colors that you can make look just a bit different when you need a "new" look from old clothes. Hopefully you all enjoyed this, and if you'd like to learn more about how to manipulate and pair colors let me know in the comments and I may come back to this subject again soon. I really love talking about color, and when I went to art school we spent a year in one class completed devoted to learning to use color in ways like this. I'd love to share more with you all. The Rafiki Foundation is a Christian organization that works in Africa providing homes, medical and educational services to orphans, training to teachers, and helps widows in the community learn various crafts to support themselves. Their end goal is training communities for a better standard of living that's sustainable and entirely run by the community members themselves. The widows there make jewelry, bags, clothing, baskets, and home items and then teach others what they've learned. I heard of them through the church my family went to when I was growing up and love how passionate they are for the work they are doing. 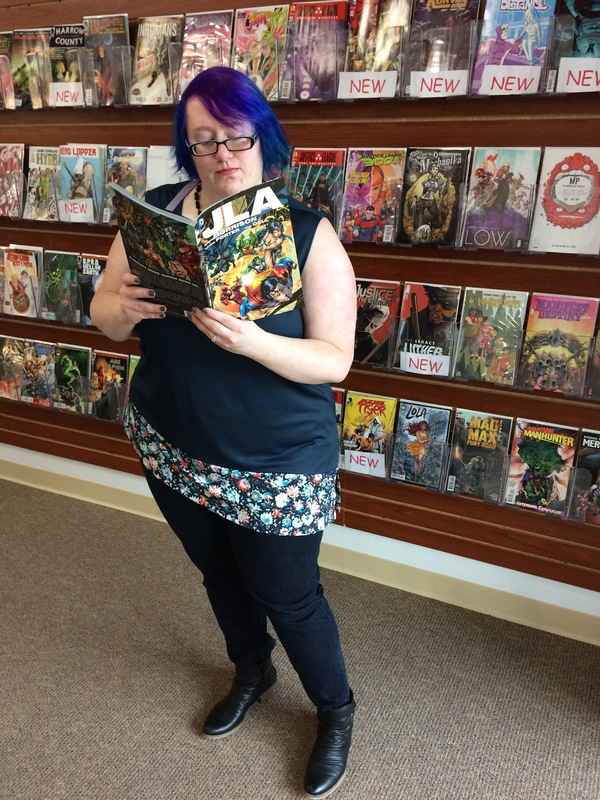 I'm reading one of the selections for Fight or Flight Comics (My local comic book store! Raleigh, NC) "Word Balloons" discussion group. Bryan snapped this shot of me last week when we stopped by the store, and tomorrow we'll me up for the discussion group. I'll tell you all about what I think of the 3 books we're reading by reviewing them next week! 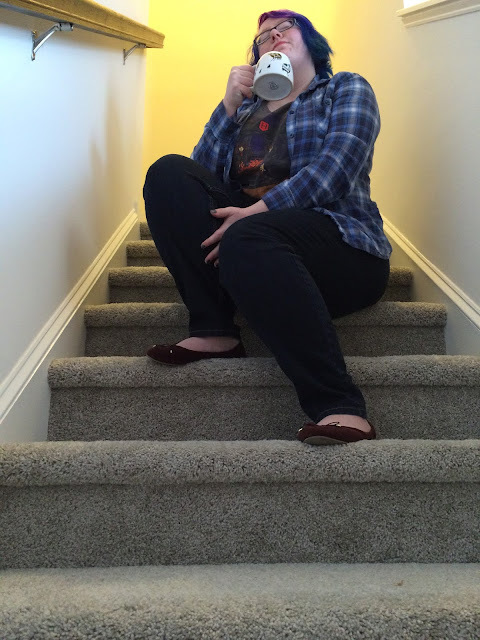 I really love that mug, I got it when my friend Holly and I were on a road trip and visited Mesa Verde National Park. The designs are from Mimbres tribal designs that originate from the cliff dwellers that used to live at the Mesa Verde site. You can get a better look at it here◊, I have the one with the quail design, but they're all really lovely! I had just been studying Mimbres and other Native American pottery the semester before our trip, so I was thrilled to find a keepsake with one of the designs on it. And lastly here's a peek into my bedroom. 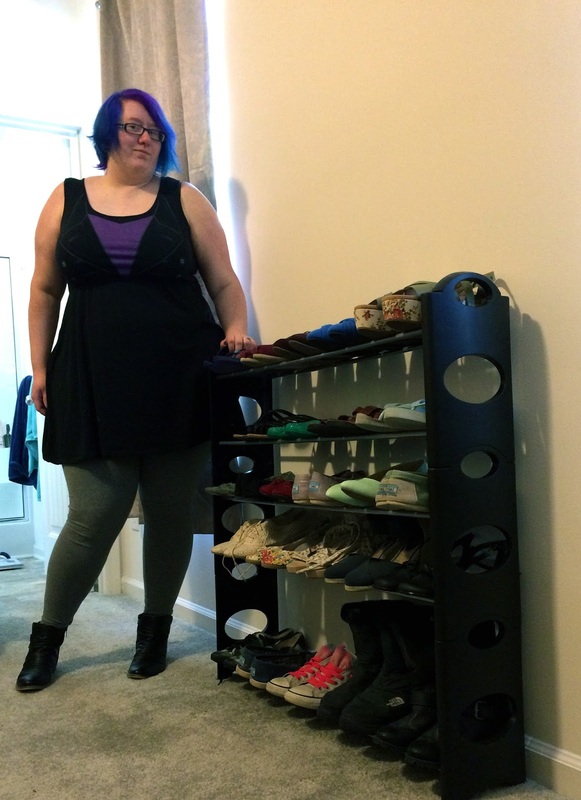 My husband was sweet enough to let me get this big shoe rack so I could store my shoes more easily. I love having them all visible and it allowed my to go through them all one final time and everything else is going to be donated or sold! I'm so glad, I was hanging on to shoes I had from 15 years ago, and shoes that didn't even fit me well. Speaking of things selling my Thred Up order was processed and if you'd like to see the items they accepted (about 1/2-2/3 of what I sent) you can have a peek here and maybe even catch a sale if you like what you see. 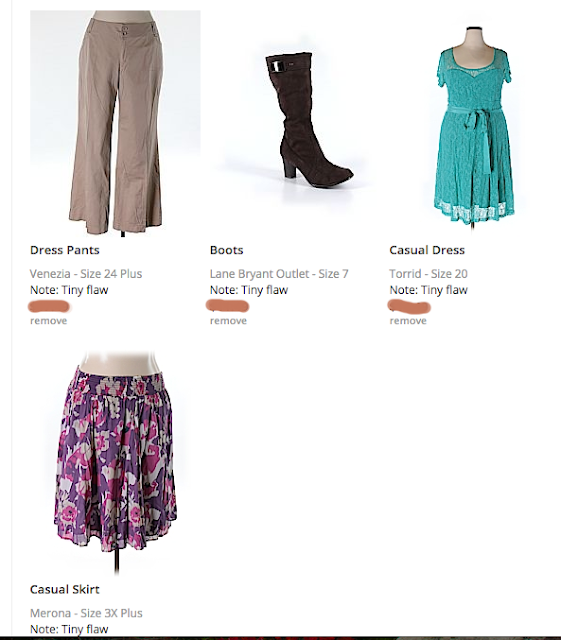 (Thred Up is an online consignment shop to buy and sell clothes from, you can get $20 off your first purchase from this link if you want to check them out) I found that the good stuff goes fast, and you can hold items in your cart for up to a day (thought admins may remove them in some cases). So you can put some things in your cart that you like, do something in another window, and reload the first page of new items and find new things every 10-15 minutes. This works especially well if you shop in the evening. And since I had some credit I did buy a couple of things! I'm nervous to see how they work out, but will let you know. Let me know what you think. Let me know what you think of this batch of Pantone colors in the comments. Anyhow, that's all for today ladies and gentlemen, thanks for stopping by, and I will see you next week!